I remember the first time I held my daughter’s hand. She was just minutes old, and I knew nothing about babies, so I was impressed to find that even a newborn could hold on. “Look, she’s holding my hand!” I exclaimed to myself, to the air, to anyone in the room. That she could cling to me and me to her was the most natural thing in the world, it turned out. It comes to us from the unknown depths of our biology, pre-birth. Our first skill is hanging on, no practice necessary. What I didn’t know yet was that learning to let go would also come easily, maybe naturally, to her. That she would master it quicker than me. I let her arms disentangle from my own in a swimming pool, her confidence in the floaters strapped to her was so much stronger than my own. She floated; she floats. 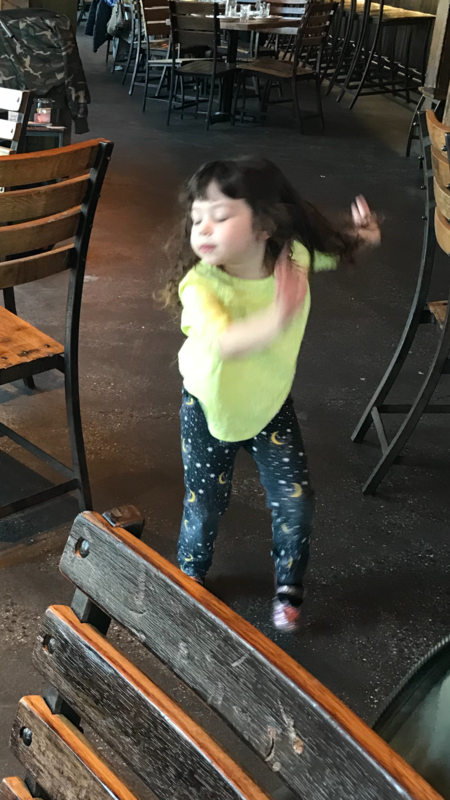 I remember almost nothing of the first day I took her to school, at 16 months old, beyond the image of her little turquoise dress fluttering in the wind as she took her teacher’s hand and walked away from her father and me without a word of goodbye. The rest of the day, beyond her walking away, the gate banging shut, closing me off, sending me home, is a blur. Many of my best and most acute memories of her are this: she turned away from me. Just this morning I took her to school a few minutes early, had a conference with her teacher while she played with her friends in the other room. “Come say goodbye, don’t leave without saying goodbye,” she said, looking over her shoulder at me as we split up. Twenty minutes later, armed with the overwhelming joy of her progress report, I wandered across the hall, to where she was now seated with 10 other children, doing a puzzle, where the goal was to put together a bear, only five pieces, dressed in a tutu. She had the head and the feet already locked in, and was puzzling over the middle section when I came to her. “I came to say goodbye,” I knelt down to her, touching her face. I saw her little shoulder shrug me away, her concentration has improved: just last year, her teacher told me in the conference, any interruption broke her away from her work. Now, she is focused, she was focused on the bear, not me. What she requested just minutes before—to see me once more before I left—she no longer wanted or needed. Only I needed it. People have told me since Zelda was born that she is so much like me, but what I know they mean is this: she looks like me, the way I looked like my own mother. She is not, in fact, like me at all, as far as I can tell. I know she’s only four years old, but it’s so obvious, so pointed and so true. Where I was and am anxious and overly emotional, turned in upon myself and grave, always worrying about what will happen next, she is living just for now, she is talking her way through every day, singing and brave. She isn’t holding back, she is not afraid. I clung to my mother geographically and emotionally until I was nearly 30. I wasn’t honest or open with her, I was merely vigilant. Worried. Worrying. Zelda tells me what she thinks of me every day: comments on my new lipstick, my bad hair, the fact that I seem to be in a bad mood one morning. She doesn’t worry about me because I am less to worry over than my mother was, but also because she doesn’t worry the way that I did, she isn’t like me. She sees strengths in people where I have tended to find weakness. We look at our newborns, our babies, our toddlers, and we see fragility. We see them hanging on by a thread, felled easily in our minds at every turn. And this danger is, of course, real. My job has been, these past four years, to keep just this one person alive. It will be my job, presumably, until the day that I die. I cherish it, it tortures me, keeps me awake at night when she has a cold. I held back tears as I watched her bravely endure three tiny stitches in her chin, singing “Do Re Mi” as we went. She feared pain, I feared the kind of loss she doesn’t even know about yet. “I’m okay!” is the first thing she says when she falls down now: her job, she sees, is to reassure me. Where I see fragility, there is a quiet and growing strength. There is steel in the veins running through every hope, every tumble off the jungle gym, every waking moment painful to me only because it is both so terrifying and so beautiful. Letting go of my own mother—really letting go—is one of the hardest things I’ve ever done. Nothing had prepared me to walk away when I did, and it stung me afterwards to think about it for years. Whether it was hard for her to let me let go, I can’t really say. But the hardest thing I’ve seen Zelda do recently is learning how to write, which is frustrating and tedious. “One of best things to have happened to me,” I told her, “is learning how to read and write.” I don’t remember doing it, really, and I’m sure that it was just as seemingly impossible for me as it seems insurmountable some days for her. But what I said was true: the best refuge I have found in this life is to read and to write, and watching another human being acquire that skill is overwhelming. “You need to practice doing things that are hard,” I told her. “It’s hard because it’s worth it.” Not everything that’s hard is worth it, I know that now, though I hope she has a few more years before she learns this herself. And when she lets go of me, I know she’ll have had lots of practice. Holding on is what we do, it’s the easiest thing in the world. Letting go is what we must do. And it is not a mark of my confidence in myself that enables me to let go sometimes, but of my confidence in her. The Parent Rap is an endearing column about the fucked up and cruel world of parenting.